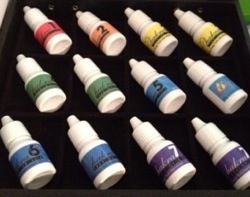 These are very high frequency Astral Oils developed by Dr. Yuri Kronn and Dr. Mikio Sankey based upon the Qabbalistic Tree of Life and Esoteric Acupuncture Theory. Each of the oils in the Astral Oil kit corresponds to the seven major chakras and are imprinted with the frequencies of specific gemstones, specific biochemical elements and the corresponding chakra color. Each of the oils are also imprinted with the specific frequencies of various Archangels corresponding to their respective Sephira of the Tree of Life. These oils are great for use by non-acupuncturist who wish to use certain New Encoding Patterns developed by Dr. Mikio Sankey for balancing and tonifying the chakra system. Non-acupuncturist can use these oils by themselves, or use these oils along with tuning forks, crystals, selenite wands or other tools of their choice. Also, acupuncturist have placed these oils on specific acupuncture sites of the New Encoding Patterns followed by needling those specific acupuncture sites . The main goal in any of these treatments is to bring the client into his or her Heart Center by balancing the chakras and opening up one’s Antahkarana (“Rainbow Bridge” above the Sahasrara/Crown Chakra).